Configure µVision project to capture MTB trace data as described below. Make sure that ULINKpro debug unit is connected to the target board and PC, and is properly configured in µVision . Restart the debug session and observe the captured trace in µVision Trace Data Window. Due to its intrinsic simplicity, MTB doesn't support advanced, trace-based features available in µVision, such as Performance Analyzer, Execution Profiler, Code Coverage, Logic Analyzer. 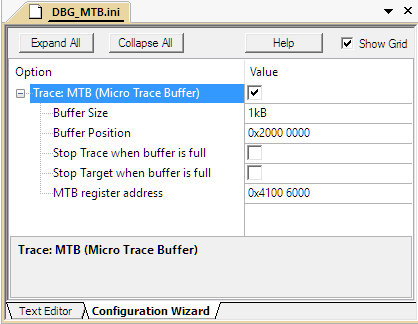 MTB tracing works on all supported debug probes in Serial Wire Debug (SWD) as well as in JTAG Debug modes. µVision uses a debug initialization file that configures and enables the MTB in application projects before the debug session starts. MTB configuration steps described below apply to all supported debug probes. Create a text *.ini file and enter the code that configures the MTB on the target device. Many MDK example applications already contain in the root folder a pre-configured initialization file for MTB setup (DBG_MTB.ini). //      <i> Trace buffer size in device RAM. MTB memory shall not be used by application. //     <i> Starting address of the trace buffer in RAM. MTB memory shall not be used by application. //     <i> Device-specific address of the MTB position register. Trace buffer position and size in device RAM. For proper operation, it is critical to ensure that MTB is located in the RAM area that is not used by the executed firmware. Stop Trace and Stop Target flags when trace buffer is full. As MTB is a circular buffer that gets read only when debug is paused, these flags help to ensure that trace data can be read before it gets overwritten. Device-specific address of the MTB position register according to the device datasheet. Open the dialog Options for Target, go to the Debug tab and provide the path to the DBG_MTB.ini file in the Initialization File field. After restarting the debug session the captured trace data can be now observed in µVision Trace Data Window. See MTB configuration for Cortex-M0+ based NXP MKL25Z devices for platform-specific example. Application Note 237 further explores MTB configuration and operation on Cortex-M0+ NXP LPC800 devices.